This month, I was honored to write a cover article for the ASHA Leader. 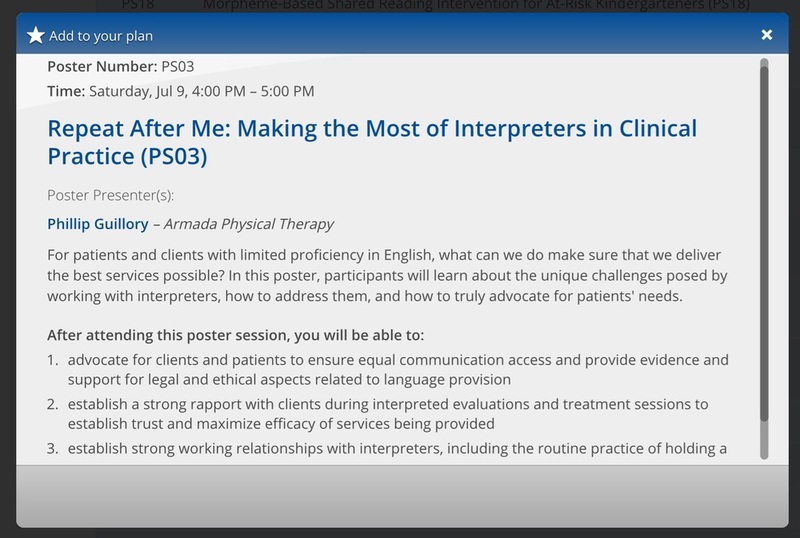 It covered one of my great passions: working with interpreters in clinical settings. “Just say what I’m saying, word for word!” It’s common for interpreters to hear this from clinicians. But this statement can have different meanings. This article is a part of the work I've been doing the past two years, starting with my poster at ASHA Connect and the subsequent seminar at the ASHA Convention in Philadelphia in 2016. In this month's ASHA, there's another excellent article diving into more detail about making sure your services are accessible to all. You can read that article here. This was my first time to present, and doing a poster was a wonderful experience all around. It's such a nice way to meet with people, and I learned as much from people who stopped by as I hope they did from me. It turns out there's a lot of work between writing a proposal for something and then bringing that something to life. In preparing for my very first poster presentation, I've come to understand that like with many endeavors, the work you end up doing often seems much different than what you envisioned in your head. In part, I think this is because the more you dive into something, and the more you think about said something, the greater it changes your own understanding of it. In my case, I proposed a two-hour workshop which ended up being accepted as a poster. The poster format left me puzzled at first, but once I understood the challenge was for me to distill the heart of my ideas into something that was straight-forward and cohesive, I embraced it. I've spent countless hours researching, writing, editing, re-writing, and researching again, and finally have something I'm proud to have put together. I have more questions at this point than I do answers, but nonetheless I can't wait to share what I've learned.